5 | 296 students enrolled. Certification in Online Fixed Income and Interest rate futures course is jointly certified by NSE Academy & Elearnmarkets (NSE Academy is a subsidiary of National Stock Exchange of India). This course helps you to become an informed investor by providing you fundamental information on Fixed Income Securities and the Fixed Income market. This, combined with the knowledge of product and portfolio management theories enables the candidate to research and analyze how various market conditions affect the securities. Moreover, it gives the participants a basic understanding of concepts like Time Value Money, Government Bonds, Interest Rate Derivatives and many more. Thus, providing them a powerful insight into various anomalies and helps an individual to plan for future economic changes, like interpreting the impact of national interest rate or strength of the housing market would have on their investment decisions. In fixed income derivatives, we provide the complete knowledge in the immense growth of the market, how to use the various derivative instruments, the issues that the markets are currently facing as well as these instrument's impact on fixed income portfolios. This course aims on providing a running start in the high-stake world of financial investments.The balance created between the theoretical knowledge imparted and the practical application equips the learner to find and analyze fixed income securities, understand the concept of fixed income markets and the economic role of debt market. It introduces the concept of underlying assets of permissible interest rate derivative contracts in India, flow of clearing and settlement which helps an individual to achieve their own personal goals. Students enrolling for Certification in Online Fixed Income and Interest rate futures program will be given a “Certificate of Completion” from NSE Academy, facilitated by Kredent Academy. The participants will also be given free access to related webinars conducted by Kredent Academy for further knowledge enhancement. An email query support, Question & Answer community platform can also be availed by the student for any kind of doubt clearance related to content while pursuing the course. This program will benefit Graduates/ Post Graduates, Working Professionals looking for specialization in the Fixed Income domain, candidates wanting to understand the effects of IRF on the economy. 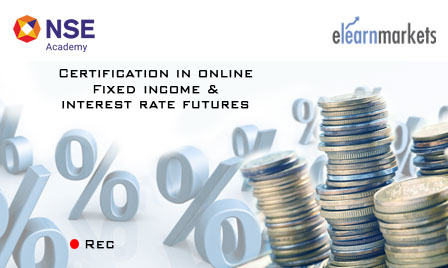 Under this course “Certification in Online Fixed Income and Interest rate futures”, the participant will be required to appear for appear for the online examination hosted on the website of Elearnmarkets.com. Please note that the participant will get the Certificate of Completion of Certification in Online Fixed Income and Interest rate futures after successfully clearing the online examination.